This question was asked by a child at Our Lady of Fatima, La Fossette, Haiti and directed to members of my church who were part of a mission trip to our sister parish in March 2009. It echoes grimly today. People in Petionville waiting for water. Photo by Herb Allison. Last night, Haiti – the poorest country in the Western Hemisphere with 80% of its people living below the poverty line– was hit by a 7.0 earthquake, the largest in the country’s 200-year history. The damage is unknown but the hardest hit area was Petionville, a hilly suburb of Port au Prince, where cement buildings pancaked, mountains crumbled, and streets collapsed. I heard the news from my brother-in-law who was calling to find out about the safety of my stepdaughter Lindsay, who lives in Santo Domingo, Dominican Republic – which shares the Hispaniola Island with Haiti. After a panicky, anxiety-ridden hour tracking down Lindsay we learned that, blessedly, the Dominican Republic had been spared but Haiti, once again, is a disaster area. 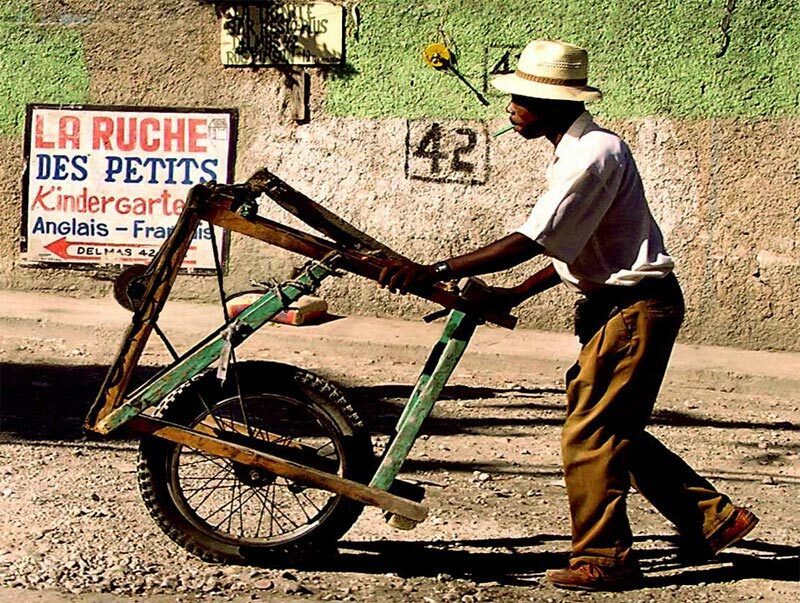 In a sense, I feel deeply conflicted about Haiti. It seems so hopeless, so accursed, so destined for disaster – it’s difficult to feel as if anything could really help that poor, wretched country. 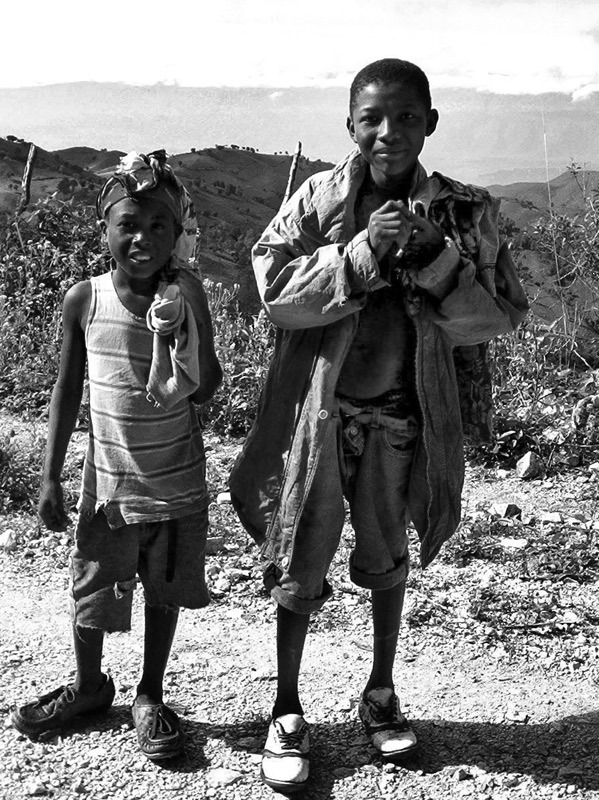 Haiti is like the Job of the modern world, suffering through one catastrophe after another. And yet, the people are so beautiful, so hopeful and so resilient that it’s impossible to look away, or walk away. 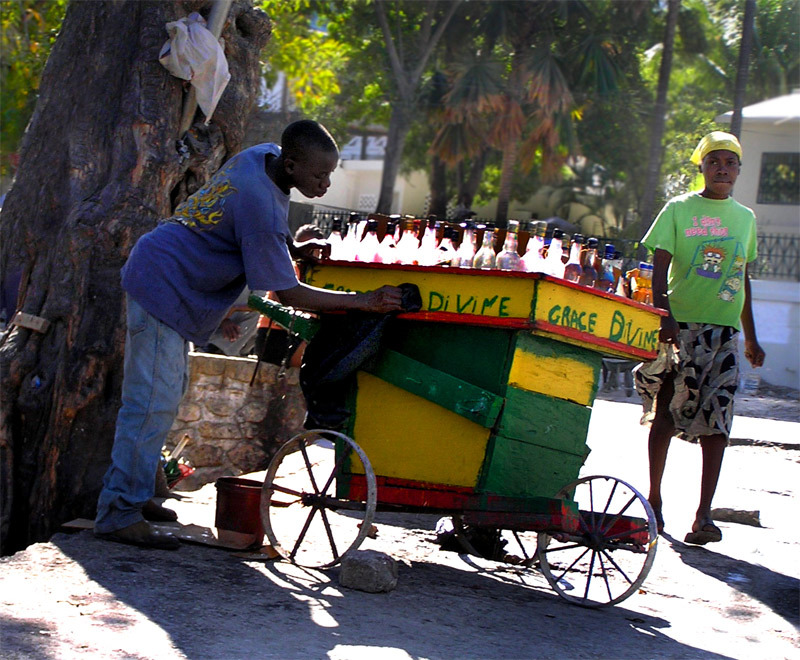 Haiti has a proud past – it was the first independent nation in Latin America, and the only nation born of a successful slave revolution, with a vibrant and rich culture. Yet in the past fifty years, its people have suffered under some of the most corrupt and repressive regimes in the world – many of which were supported by America. The country is about the size of Maryland with a population of 9 million people, 2 million living in Port au Prince in densely populated slums. 50% of its people are illiterate. The environmental degradation of the countryside is intense, as poverty-stricken residents have cut down almost every tree in efforts to forage for firewood. And in 2008, four tropical storms wreaked havoc on the roads and infrastructure and laid waste to communities. And now this earthquake. Yet even last night, almost every story I heard spoke of people praying in the streets, singing hymns, and celebrating when another person was found. That’s why today I’m giving my $100 to Wyclef Jean’s Yele Haiti Foundation http://www.yele.org , a grassroots organization dedicated to promoting education, sports, arts and the environment in Haitian communities, while providing food distribution and emergency relief on the ground. Call it the triumph of hope over experience. Or just call it help. The second group from the New Orleans Baton Rouge area that I know of has gone for another week. Things are getting better. Individual reliance on SOlar units like the individual blue 45 gal bbls on the roofs all over Haitie should be a major focus instead of huge power grids. Send anything you can for the kids. As I was reading this, HLN is reporting a segment on Haiti – one year later. (That was really weird.) They said that 37,000 people have died since the earthquake from cholera. HLN also talked about how many people are still living in tents. If you read this today you may want to watch HLN and get an update. I just sent school type supplies, balls, beads and ribbon and sewing stuff for the kids of Au Palines on Tortuga. Many of the kids don’t go to school. I sent these to Both the Philadelphia Baptist Church and the Sacred Heart Catholic school. Send what you can, ask workers and employers to help. Many are more than willing. Send things thru an established Haitian Relief effort. I remember all the grat help that we got from all over the US and the world after Hurricane Katrina – payback is a joy. I have been to Haiti three times and each time come away moved by the deep faith and dignity of the people who live in such overwhelming poverty. My life has been enriched by my experiences in Haiti and I am heartbroken and haunted by the devastation and misery of this earthquake. I have heard and prayed about the Haiti tragedy but it is only through your post that I knew more about the disaster and about the place. Thanks to you and the links you gave. Let us continue to pray for the country and the people!